When Luftwaffe bombers first appeared in force in the night skies over London in September 1940 they heralded the beginning of The Blitz - the most sustained period of concentrated bombing aimed at British cities during World War II. Robert Taylor’s evocative new painting brings to life the frightening scenario of the Luftwaffe’s night bombing campaign. It is December 1941, and London is once again under concentrated attack. With fires raging below, the armada of German bombers is clearly visible in the night sky as they sweep across the city. Shimmering in the glow of destruction, a lone Hurricane night-fighter from 85 Squadron, based at nearby Gravesend, engages Heinkel 111s of KG55 in a desperate attempt to break up the formations. 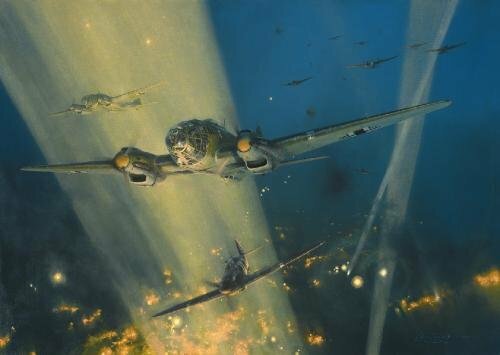 Adding great authenticity to each print in Robert Taylor’s dramatic new five-signature Commemorative Limited Edition print FURY OF ASSAULT, every copy has been individually hand-signed in pencil by four Luftwaffe Heinkel pilots who flew with KG55 during World War II along with an RAF Hurricane night-fighter pilot.